There is nothing like the big sky and red sand of outback Australia. The vast landscapes, the harsh environment, and the life that thrives there despite the tough conditions. The closest access to the outback for me from home is in the 'Heart of New South Wales'. 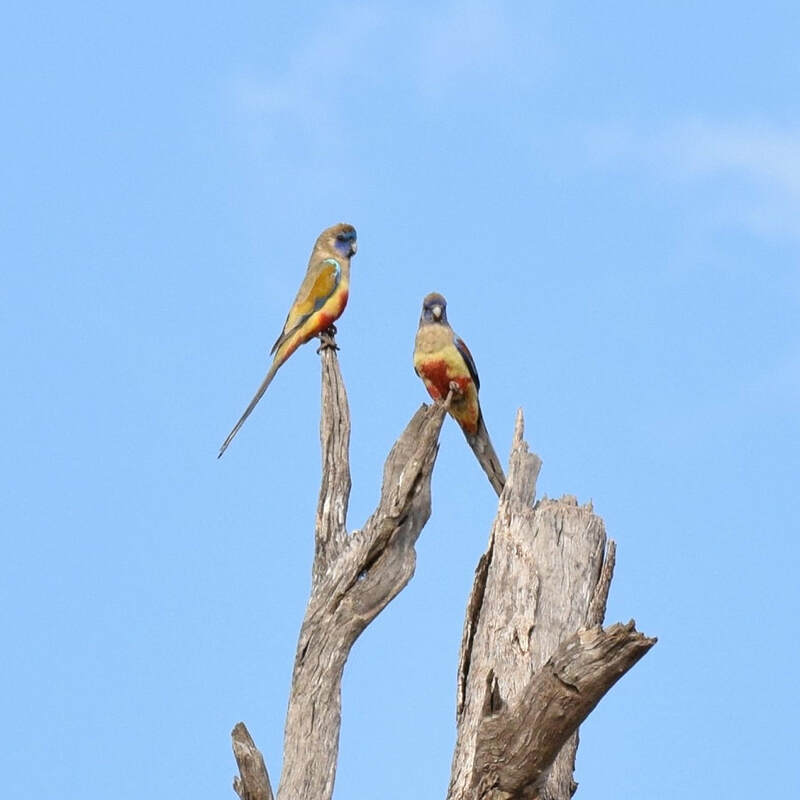 A couple of times a year I head out to Lake Cargelligo to see what birds I can find. I'm always hopeful of finding something new, and so far, I have done that on every trip. 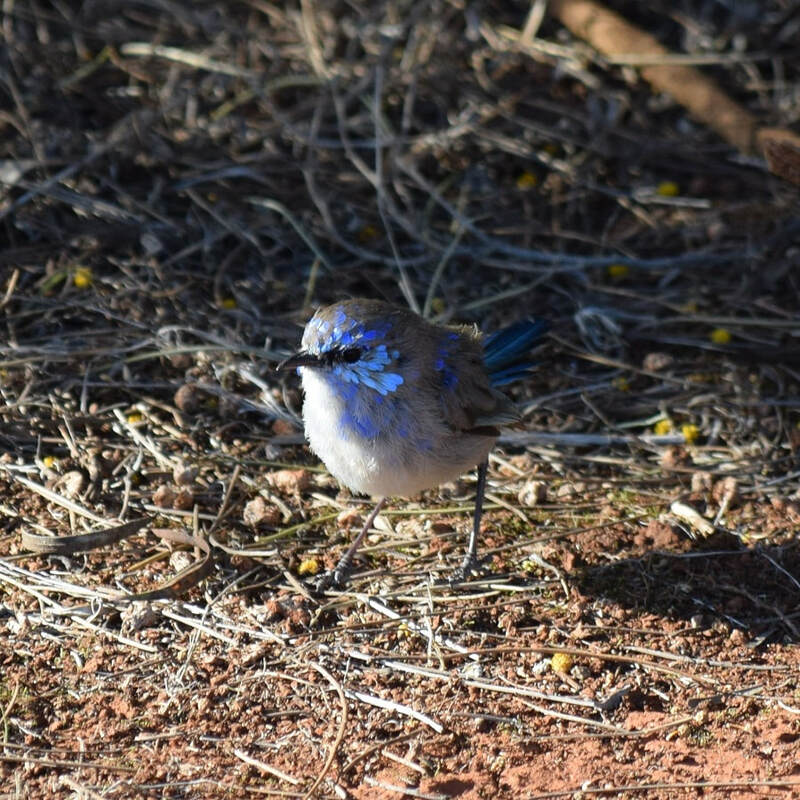 On this particular weekend in early September the main reason Lil Sis and I set out on the five-hour drive west was to look for Splendid Fairy-wren in breeding plumage. 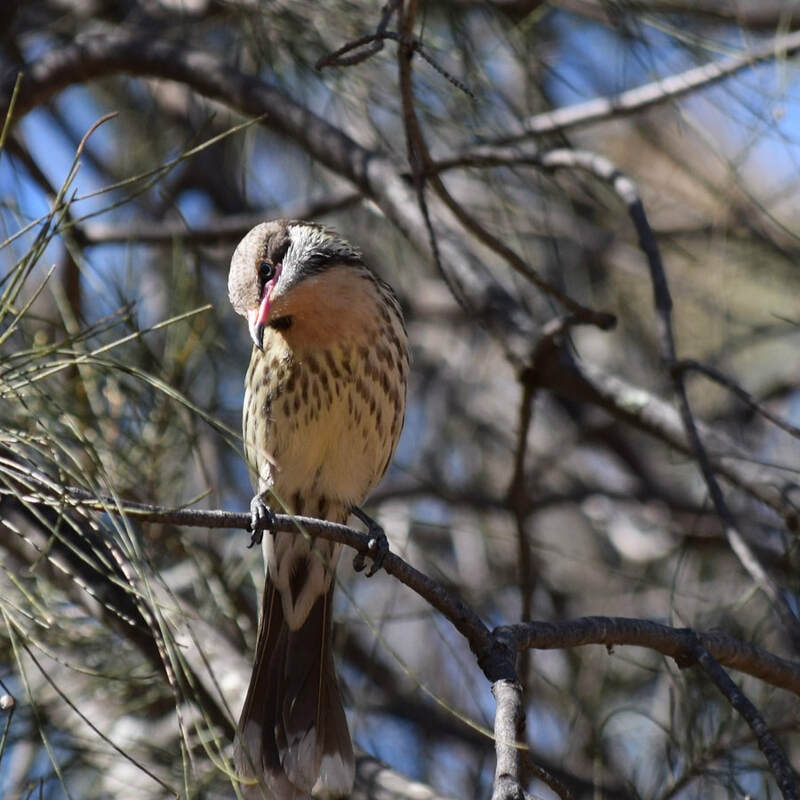 We had encountered this species at Balranald and Hattah-Kulkyne National Park, but only in non-breeding plumage. While these birds were still lovely, we wanted to see for ourselves just how splendidly blue they really could be. We set out for our weekend away with a few target species and spots to look for them in mind. 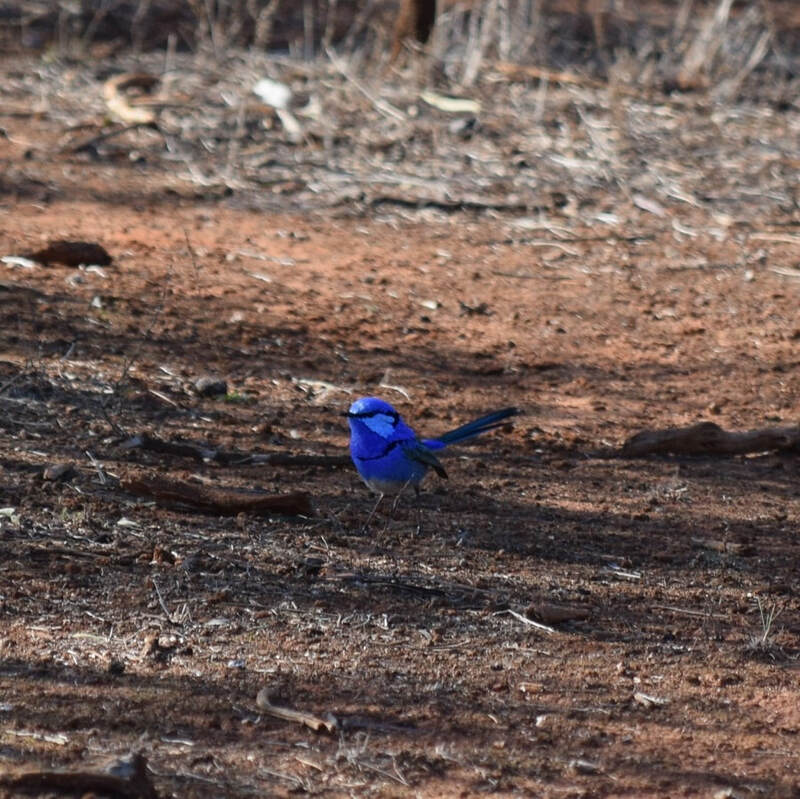 First stop was Back Creek State Forest, a place where I have encountered Diamond Firetail and where I saw my first ever Variegated Fairy-wrens. On this trip we found plenty of Eastern Yellow Robin and Brown Treecreeper, a Striped Honeyeater and some Spiny-cheeked Honeyeater. 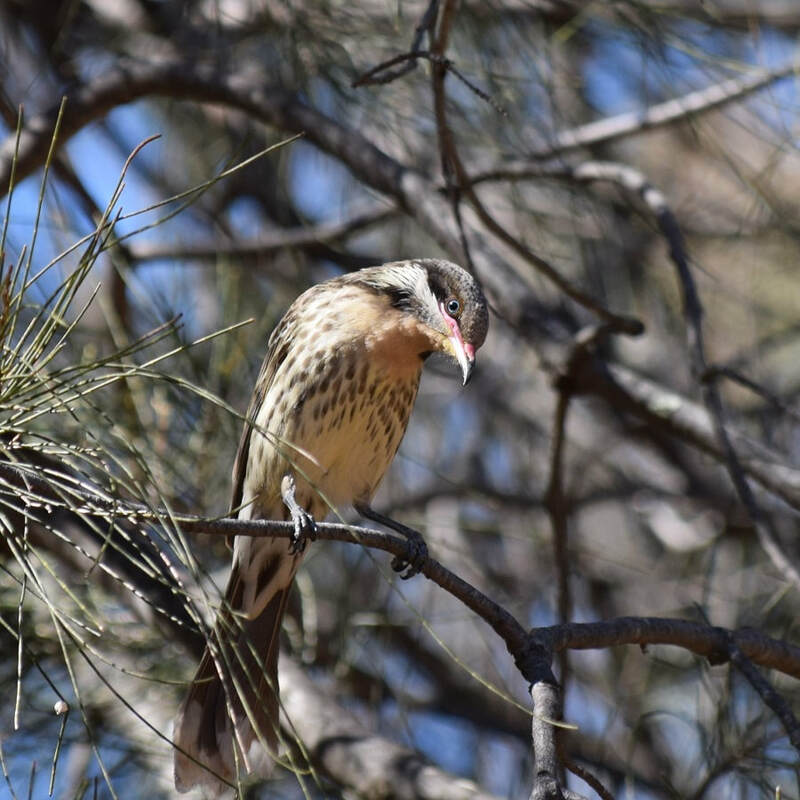 If there is one bird song that says to me that I'm getting into the arid country, it's the hauntingly beautiful call of this honeyeater. One particularly curious individual followed us quite closely as we wandered through the cypress woodland, eventually posing for some photos, working every angle like a professional. These were the best views Lil Sis had ever had of this species and it quickly became a favourite of hers. And with those striking blue eyes and wide pink 'smile', why wouldn't it? Around midday we arrived at the Lake Cargelligo Wastewater Treatment Works, which may not sound like the most glamorous place in the world, but is rich in birdlife and I have seen some beauties here. Today I was disappointed to see that sheep and cattle have been allowed in to graze the areas around the ponds and much of the habitat once occupied by Little Grassbird and White-winged Fairy-wren has been ruined. The numbers of ducks and waders was low too, compared to previous visits, but we were rewarded for making the effort to visit, by not one but six Baillon's Crake. These tiny, and usually secretive rail, were all feeding out in the open and not at all worried by our presence. Driving into town we went past the showground and I had a feeling. 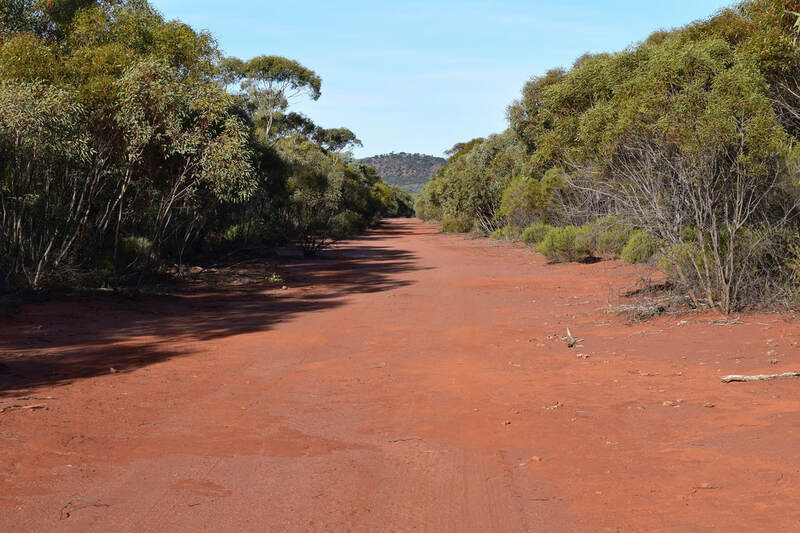 I'd never taken this road into town before, and I said to Lil Sis to keep an eye out for Banded Lapwing, a nomadic species which had evaded me until a trip up north of Bourke back in April when I finally managed to spot two. The showground yielded results, we pulled over to the roadside and counted 10 Banded Lapwing scattered across the grassy field. We spent a little while in the presence of these enigmatic birds. 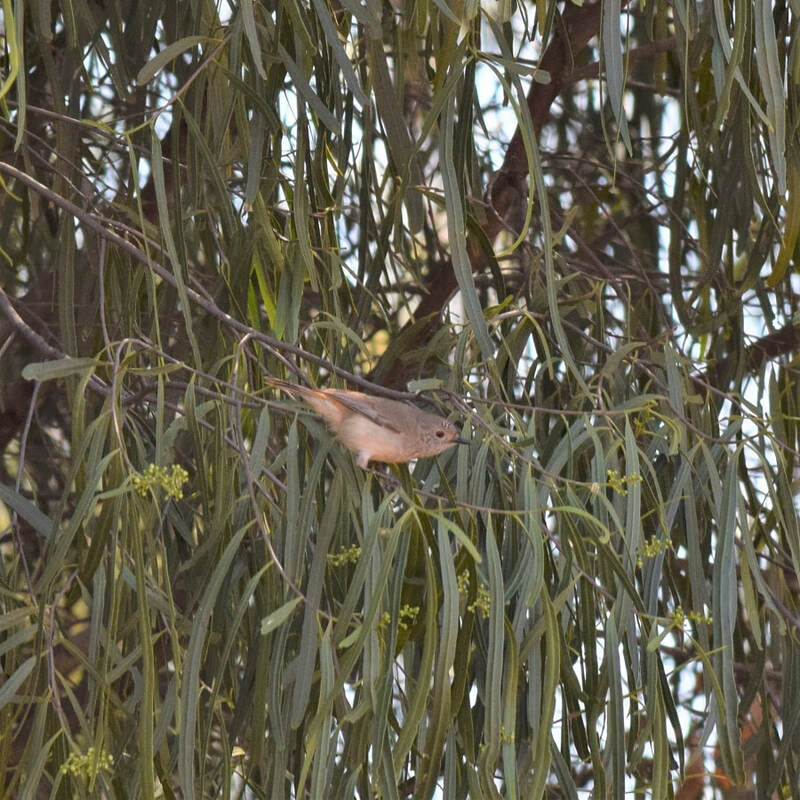 We took care of necessities, such as lunch and checking into our motel, before heading out of town with Splendid Fairy-wrens in mind. On the way to Round Hill Nature Reserve we stopped at 'Chat Alley' a place I have stopped many times in the hope of spotting Orange Chat. 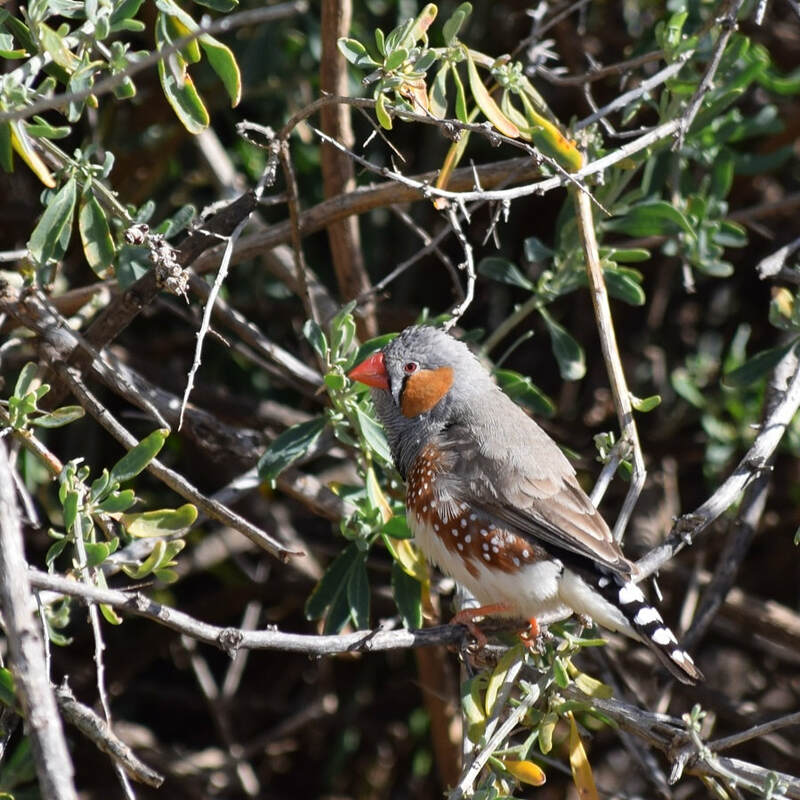 Every time I've visited I've managed to spot the resident Zebra Finches and White-winged Fairy-wrens, but only once had I seen chat, and that was White-fronted, not Orange. 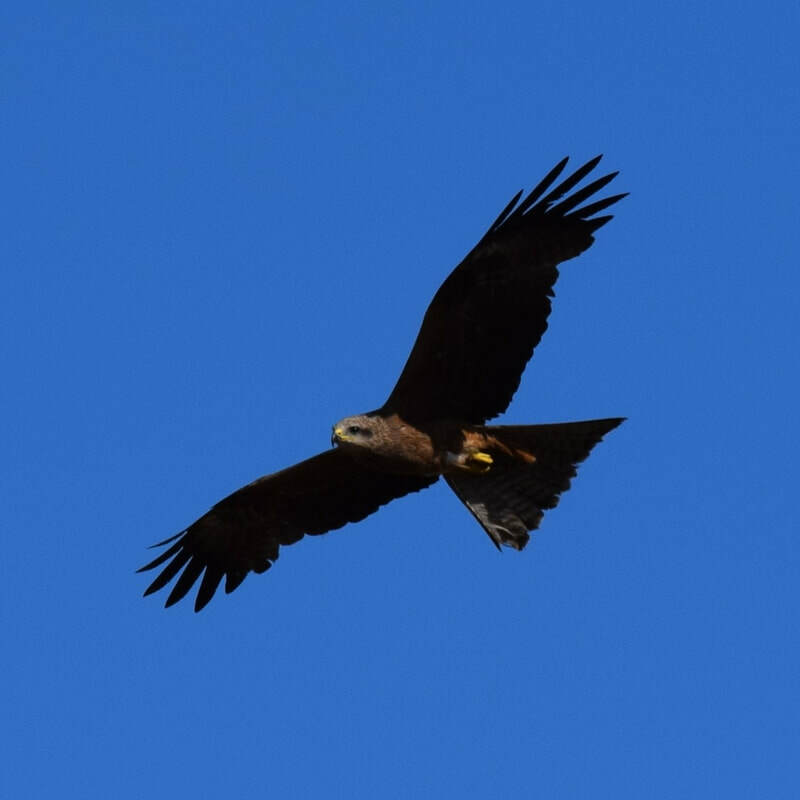 Today there were plenty of raptors, we saw Black-shouldered Kite, Black Kite, Brown Falcon and Nankeen Kestrel all at close range, and of course the finches and the fairy-wrens. I should say though, that White-winged Fairy-wren are gorgeous little birds, especially the cobalt blue males and seeing them is always a treat. After half an hour, I accepted that I had missed out on the chats again and headed for the car. I don't even know why I looked up when I did, but I caught a flash of yellow to the left, a group of six Orange Chat! Ticking a new species is always a rush, but an absolute beauty like this is special. Among the group were two adult males, absolutely striking with their vibrant orange plumage and black masks. A stunning and very satisfying lifer. Further up the road at the entrance to Round Hill Nature Reserve we were rewarded as soon as we stepped out of the car. A vivid, almost iridescent, blue male Splendid Fairy-wren hopped into view. Against a backdrop of red desert sand, he was like a tiny jewel in the desert environment. Moments like these are why we travel. Five hours in the car disappears when you encounter something so beautiful and elusive. At this spot too, we also found White-fronted and White-eared Honeyeater, the latter being very accommodating and giving great views. 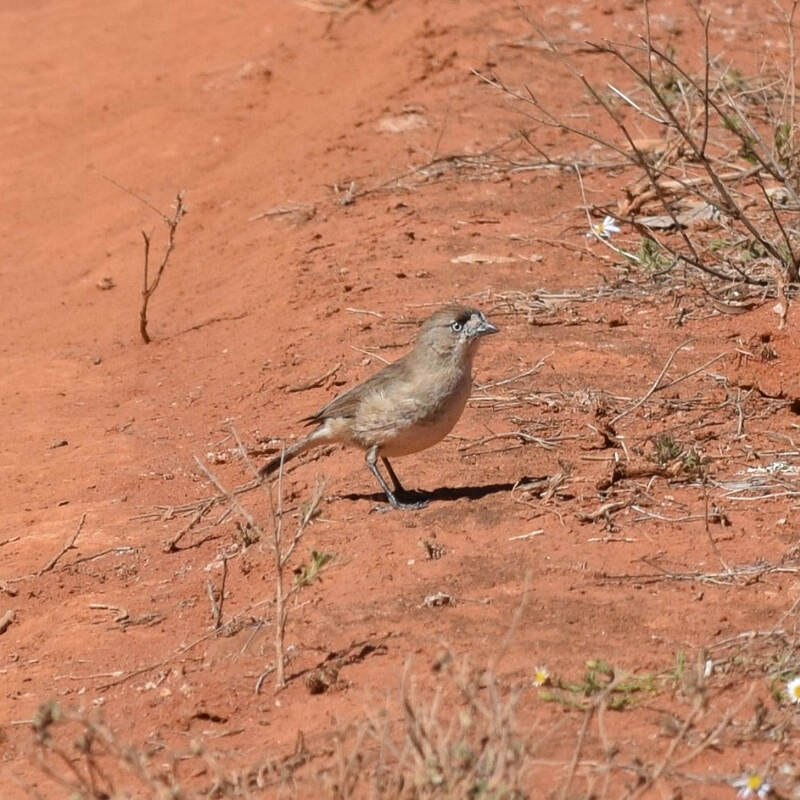 We also saw a large group of very active Brown-headed Honeyeater coming in to drink at a tiny waterhole. We finished the afternoon at the northern end of the nature reserve, enjoying views of White-browed and Masked Woodswallows with their lovely, floating flight, a family of Emu and some Western Grey Kangaroos at the eastern extent of their range. ...and one on his way. Our second day in Lake Cargelligo started with a look at the lake itself, quite pretty in the early morning light. We stopped near a nesting colony of Fairy Martin, which constantly circled about us as we admired the view. We headed north to Euabalong, for a visit to the cemetery, with a hunch that there might be some birds to be seen in the peaceful setting. We got lucky, finding some very lovely parrots, Red-rumped and Bluebonnet, which allowed us to approach quite close. Bluebonnets are remarkably well camouflaged considering the bright splashes of blue, red and yellow that adorn their dull brown feathers. 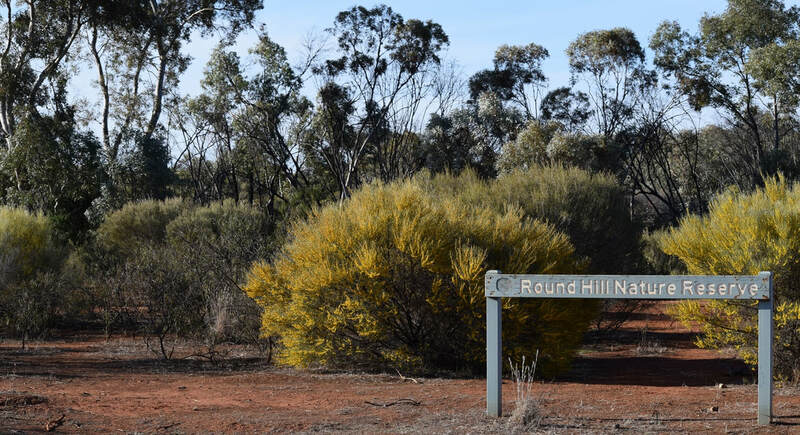 Back at Round Hill we hiked up the scree slopes of Round Hill itself, searching for nightjars, but settling for a stunning male Red-capped Robin and being serenaded by the pretty, tickling song of Western Gerygone. 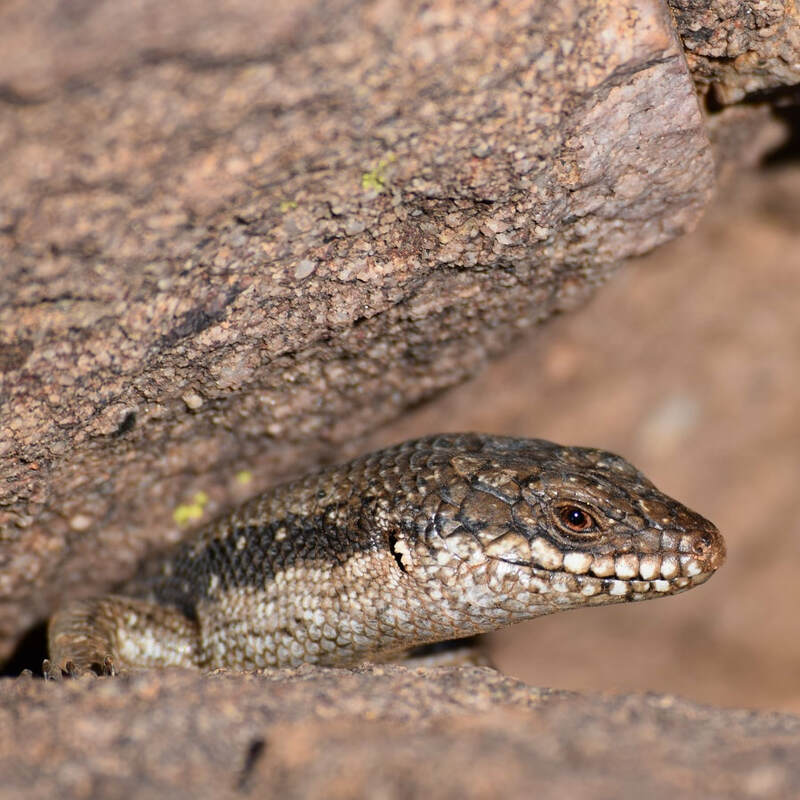 We also encountered a Tree Skink, hidden in a rock crevice, a new reptile for both of us. 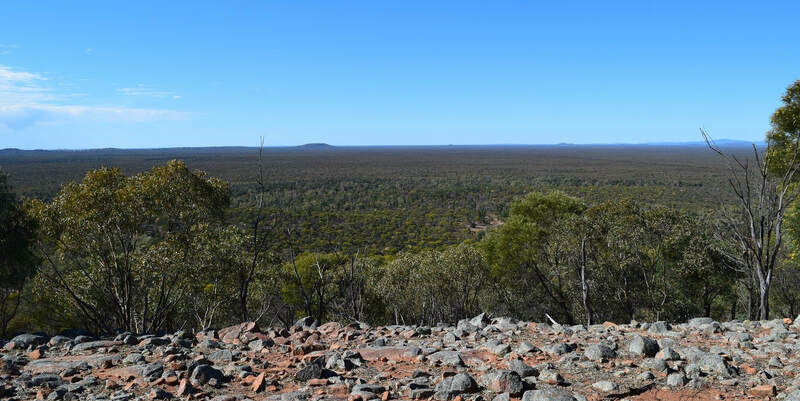 From the summit we had uninterrupted 360-degree views of the surrounding olive-green and silver-grey Mallee scrub and cypress woodland, the expansive Cobar peneplain and the distant craggy peaks of the Ural range. Over the course of the rest of the morning we encountered lots more honeyeaters, including a displaying male Black Honeyeater, and lots of those tiny, often overlooked gems of the Aussie bush. Southern Whiteface, Inland Thornbill, Chestnut-rumped Thornbill, Yellow-rumped Thornbill, Weebill and Mistletoebird. All gorgeous little birds when you stop and take a closer look. We drove home via Condobolin, stopping at Gum Bend Lake for a quick look. Here, on the banks of the Lachlan River we saw hundreds of Little Corella, and on the lake itself, huge numbers of Black Swan as well as some delicate Whiskered Terns. 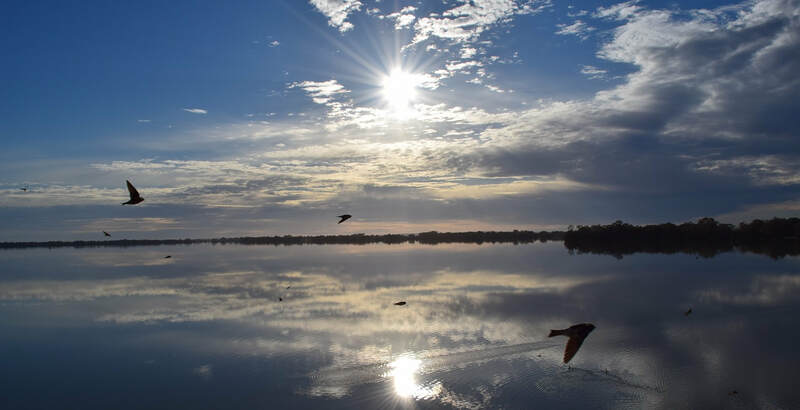 Lake Cargelligo and surrounds is not a part of Australia that is on most people’s must-see list, but it's a place I keep going back to because there is always something new to discover. 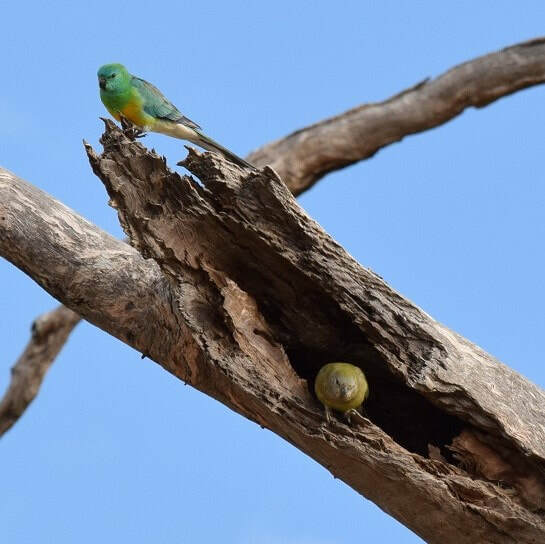 If you are willing to take the time to look, and when you see the stunning colours that birds like Orange Chat, Splendid Fairy-wren and Red-capped Robin have to offer, you will agree it's worth the time and effort to head off the beaten track.